Evolution can be defined as the change in the inherited characteristics of a population over successive generations, and might well be used describe the approach that Bremont Chronometers has taken with this, the next iteration of their MB series of watches. First shown in 2009, the MBI was a dual crown three-hander, designed and tested in collaboration with Martin-Baker, the Bucks-based ejection seat manufacturer. Martin-Baker’s change in focus from producing aircraft to saving the lives of pilots through the development of ejection seat technology was, rather poignantly, due to a similarly-named ‘plane, the MB3: Captain Valentine Baker lost his life whilst executing a difficult forced landing, crashing in a field in 1942. While industry standard tests simulate dropping a watch from one metre onto a hardwood floor (a shock of 5,000G according to the literature), Martin-Baker’s tests are limited by the forces that a human pilot can withstand. An ejection can take place at up to 18,000ft at Mach 2, producing 25-30G on exit (it’s interesting to note that any watch on the wrist of an ISS astronaut is subject to a mere 3G as the main engines ignite). 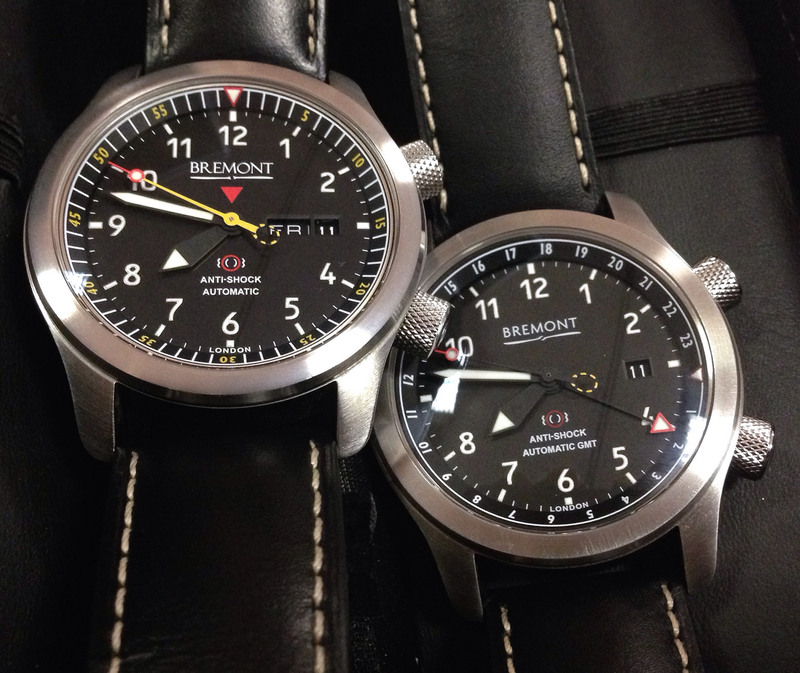 Martin-Baker challenged Bremont to produce a watch that could withstand the same tests and simulations to which they subject their seats, including salt fog and humidity, altitude, extreme temperature, vibration and (finally) ejection. Bremont’s solution was to case the movement in a softer iron core (essentially creating a Faraday Cage to ward off magnetic fields) and then to mount this inside a hardened steel Trip-Tick™ case with a cushioning polymer spacer ring. This ring absorbs the energy before it can affect the movement, protecting it from shocks or drops. Each of the crowns is push-in, rather than screw-down, with multiple o-rings, again to assist in shock absorption. As with all of Bremont’s steel watches, the hardening process works exceedingly well, maintaining the brushed surfaces of the top and bottom cases and protecting from scratches. While the MBI watch with its signature red aluminium knurled barrel was only available to ejectees, the MBII proved to be very successful with “civilians” and the military alike, being used as the base for many designs by the rather creative and increasingly successful arm of Bremont that supplies bespoke watches to the military. The new MBIII is the first to use a bronze-coloured knurled aluminium barrel, and the first to include a GMT compilation. Some purists may bemoan the lack of a “true” GMT hand, although setting the fourth hand to GMT using the internal bezel, and adjusting the main hands as one changes time zones, appears to be an increasingly common approach to tracking two times. The arrow-headed pointer is easily recognisable, and is another nod to Martin-Baker (whose warning-red triangle logo has been removed from the dial). The movement itself is a modified 13 1/4” BE-93-2AE automatic chronometer, with upgraded balance and mainspring elements and a moulded rotor. The MBIII’s internal ratcheting bi-directional bezel (which has been tweaked slightly to provide 48-clicks) remains as enjoyable to use as ever. The objective when designing the original bezel was to replicate the satisfyingly solid sensation one gets when operating a Leica lens (perhaps because the designer swears by an M6 35mm film camera). The new bronze barrel is smart and visually arresting without being flashy, sitting comfortably with a suit in a way that the orange variant may not. At 43mm, the MBIII is not small; in a strange optical illusion, the new model looks larger than the originals, perhaps due to the removal of the train-track style minute dividers from the rehaut. One thing that is also missing from the MBIII is a day indicator, but with a power reserve of 42hrs, proven reliability, and a tested water-resistance of 100m, this is a watch that is unlikely to let you down, whether on land, air or sea.